The figures are from LFC's history, the best and most famous and important players, managers and officials from 1892 to present day. The painting shows off their character and kit of their times, with periodic hairstyles, facial hair and posture. Sometimes working from black and white photos for the older players. Skin complexion, eye and hair colours had to be sourced from paintings and colour cartoons made of them from their time. Older player information, such as their heights, had to be sourced from old newspapers. 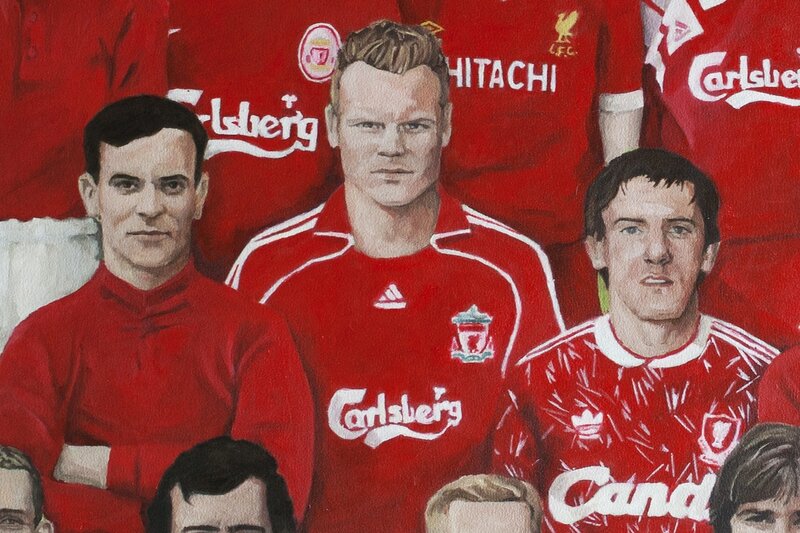 I had the opportunity to meet Robbie Fowler, Liverpool striker from the 90s (left), in the middle of painting the project. Getting supportive words from him was a huge boost to bring character and life to the painting. Such a diversity of faces, expressions, hair styles, poses and clothing are fascinating to look at and read into. Some of these characteristics are so distinctive of the eras that they come from, it says many things about football history. This epic fan art work at times felt like painting a historic work. It was a big task, and surprisingly an educational one.